"Carnival is partnering with entertainment innovator IMAX® (NYSE: IMAX) to bring the world’s most immersive cinematic experience to sea with the first-ever IMAX® Theatre on a ship. Guests will take in the latest Hollywood blockbusters, IMAX classics and IMAX documentary content on a screen that’s three decks high. Next door at the Thrill Theater, moviegoers can enjoy a multi-dimensional special effects experience. Both are part of the Carnival Multiplex, a first at sea for film fans, complete with concession stand offering popcorn and movie snacks. The Warehouse, featuring a variety of video and arcade games, is located adjacent to the Carnival Multiplex." "Featured on Carnival Vista and a first for the fleet will be the New England-inspired Seafood Shack, a casual indoor/outdoor dining venue near the Lido Marketplace eateries. This seafood-lovers’ paradise will feature a menu full of delicious, fresh favorites available for purchase, including lobster rolls, steamed lobster, fried shrimp, crab cakes, fried clams and more." "At the RedFrog Pub, Carnival will brew up great beer for good times in its first ever brewery. During each sailing two giant copper-topped glass kettles will create tasty ales and lagers that can be enjoyed on tap from the bar and through unique tabletop taps that allow guests to pour their own beer. The full bar will also offer an array of Caribbean-inspired cocktails, beers and rums. Indoor/outdoor seating, live music and brewing tours and tastings will also be offered in this fun venue. " 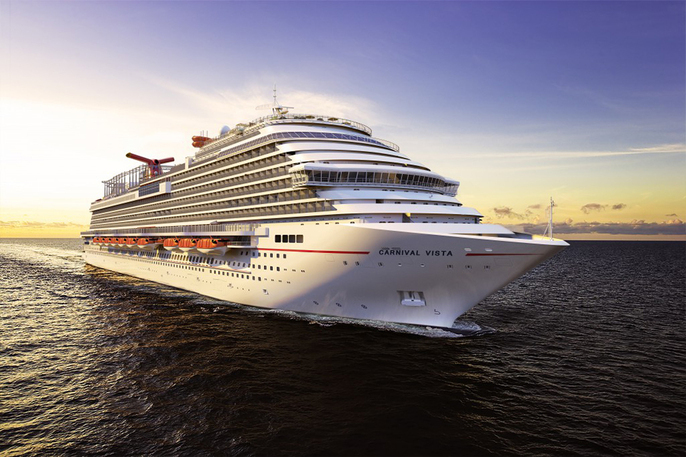 "Carnival is expanding the line’s popular Latin-infused Havana experience inside and out on Carnival Vista. Celebrating Cuba’s gloried past, Havana Bar serves traditional cocktails and bites during the day and transforms into a sizzling Latin dance club at night. The fun also extends outdoors with a new Havana Pool located aft and offering stunning views of the ocean, whirlpools and relaxation area, complete with colorful umbrellas, faux palm trees, thatched patio huts and comfy seating, perfect for soaking up the sun while enjoying a refreshing mojito." "Thanks to an expanded Lanai on Deck 5 guests can stroll or sit and enjoy a beverage at one of the many dining and bar venues that will now feature outdoor areas. The line will offer its first-ever outdoor seating options at specialty eateries including Fahrenheit 555, a classic American steakhouse, and Japanese-style Bonsai Sushi restaurant where diners will enjoy sea views as delicious as their meals. Cherry on Top will be the sweetest spot at sea, with a new premium mixed-to-order custom ice cream creation bar, outdoor seating and more than 80 bulk candy options. The intimate Library Bar will also offer guests indoor/outdoor options, in addition to the hoppin’ RedFrog Pub and stylish Havana Bar. " "Vacationers will find Fun Ship 2.0 favorite poolside eateries and bars including Guy’s Burger Joint, award-winning burgers and hand-cut fries created by chef and author Guy Fieri, and BlueIguana Cantina, featuring freshly made tacos and burritos. Poolside bars BlueIguana Tequila Bar and RedFrog Rum Bar will also provide innovative cocktail options, as will the mixologists at the cocktail pharmacy-themed Alchemy Bar. " "The ship’s main dining rooms, Reflections and Horizons, offer a tantalizing array of delicious menu items for guests who want to enjoy a full-service breakfast, lunch or dinner. The striking modern interiors created by award-winning designer BigTime Design Studios offer decidedly different décor than previous Carnival ships. The Horizons dining room will also feature a unique bar that’s the perfect spot for meeting friends and enjoying a pre-dinner cocktail or an after-meal aperitif." "The beautiful Vista Atrium will set a festive mood with its giant, multi-deck-high centerpiece that will delight guests with its LED screens and changing visuals to create the right atmosphere. It’s the perfect place to welcome guests boarding the ship, meet friends at the bar or enjoy live entertainment and dancing."